When I first started quilting a month ago, I ripped a hole shortly after in a pair of my jeans. My wife gave the go ahead to use them in a future quilt which all my kids quickly tried to claim as their own. My youngest son Jared is autistic and gets a real kick out of textures and such. So I suggested that we could make the quilt for him and give him plenty of things to play with on it. It includes both the front and back pockets of my pants with the front pockets being sewn shut just at the ends of the jeans where it hit the material. This was done so that he could put his hands in it and play. Soon after I started cutting my pants up all the kids were offering up their pants to get sewn into my quilt. I am not sure how big the piece is that I have show above in the picture but its not near to the point I can use. It has been fun finding ways to put the jeans into the quilt. The black pair of jeans in the middle belong to Rebbecca she is in the picture above. 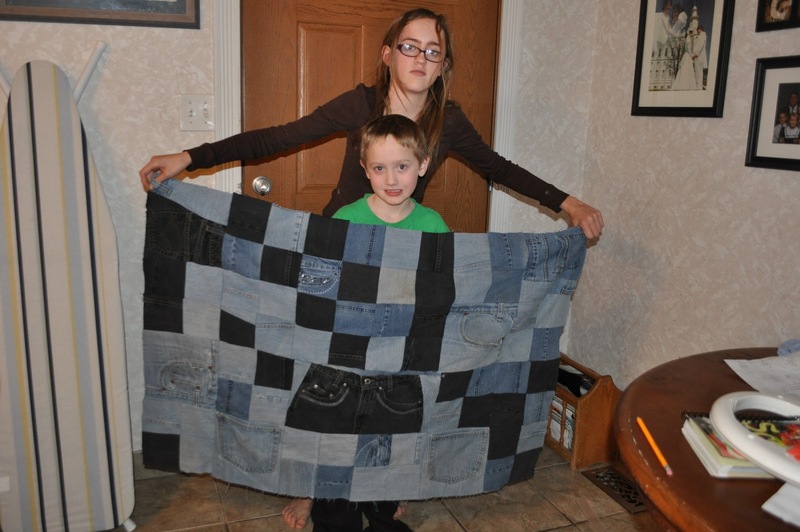 She has 2 pair of jeans in the quilt. Even my mother Jared's grandma donated a pair, he was happy because they were big and had a lot of material. I am not so sure my mother was pleased when he told her that she was glad they were huge. Right now we are seriously short on pants. On Christmas Eve we took Jared's other grandma out shopping for a new pair of pants., She was up to stay for Christmas as we broke her out of the retirement home she lives in to have Christmas with us. Any way to the point of the post while we were looking for grandma some pants in the store Jared started to pick up pairs of pants and look them up and down then put them back onto the shelf. Note that Jared is only 7 years old. Finlay he picked up a pair and tossed it into the shopping cart. All of us were siting there wondering what the heck he was doing. His grandma told him those pants would not fit her. He said "Its OK I picked them out for my quilt". While the innocents of youth is great don't we all wish we could just toss in a new pair of jeans for the quilt. Sadly we pointed out to him that we had to wear out our current jeans first. Oh well he is not the patient type, sooner or later going to have to find me a new source of jeans. I just popped over from Elizabeth's blog (Such a Sew and Sew ) to wish you luck on your quilting adventures. There are lots of blokes who quilt and some great male orientated quilting blogs out there too so if you ever want to share with the guys who quilt drop me a line and I'll send you some links ! 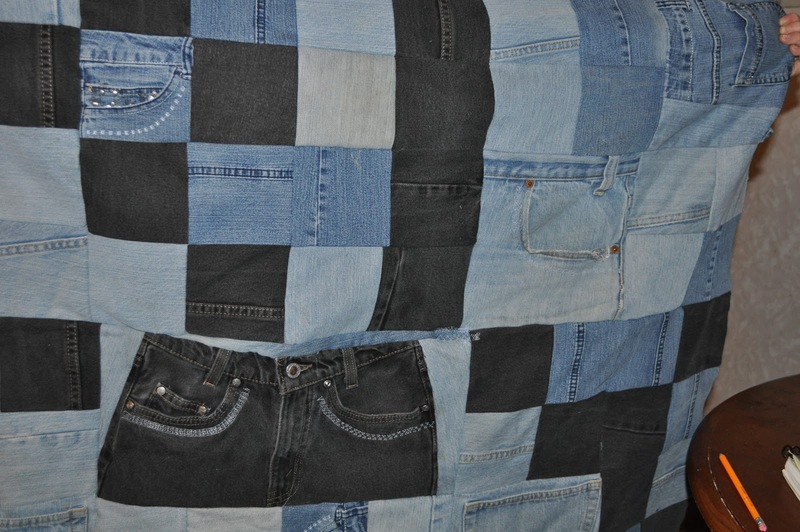 have to say that jean quilt took me back a few years. 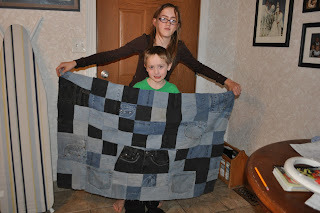 i made one for my son almost 20 years ago out of 23 pairs of jeans! it was so heavy, i had to take it to the laundromat to wash it because it didn't fit in my washer! i put batting in it and backed it with flannel. it wasn't a rag quilt, more of a tied comforter done in strips, lasagna style. that sucker was so warm! well, he finally wore the back to rags, but the jeans side is still useable and it's in my pile to 'remake' for him some day. 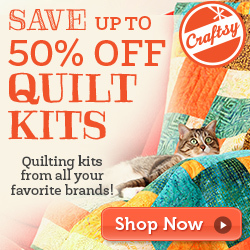 glad you have overcome the stereotype and have jumped into quilting. you aren't the only man out there doing it, but it's certainly still female dominated. hope you venture out into other patterns, beyond rag quilts. it's a great hobby and my greatest addiction - ranks right up there with chocolate! That is a really great quilt! Perhaps you can scout out used jeans at Goodwill/Savers/D.I. What a fabulous project! Not only very cool for your son texture-wise, but it just looks fun too.